Allynn Taylor is “purpose” defined. She lives her life with a solid understanding that tomorrow isn’t promised therefore making certain that each day is spent sowing positive energy into everyone around her. A couple of weeks ago, I was honored to witness her in action as she coached an intimate group on “Purpose and Vision” as part of an 8-week Creative Insight Journey course. What I learned in 1 hour and 40-minutes will undoubtedly last me a lifetime. That night, as I drove home to the suburbs of Atlanta, I continued to replay a few of the exercises that immediately brought clarity to my own existence. 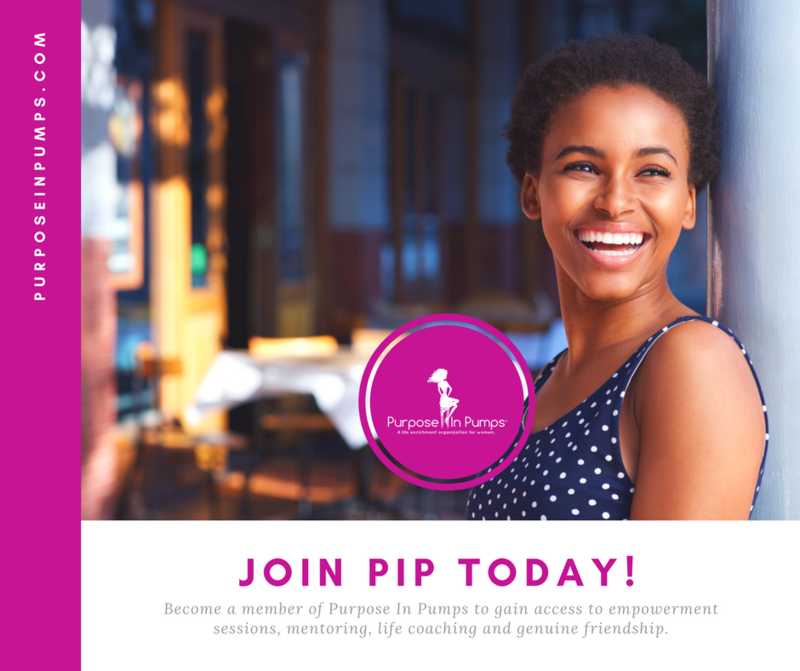 As a partner of Purpose In Pumps, Allynn will bring her “positive” expertise to the network’s members on Saturday, June 25th for the first Poised for Purpose workshop. What particpants will gain during this half-day event is nothing short of phenomenol. There’s something about knowing your purpose and walking proudly in it. Hats off to Ms. Taylor for leading by example. I’m proud to say that I’m an Atlanta native! I love my city. I wanted to be a marine biologist because Free Willy was such an inspiration. Believe it or not, this is how I ended up at Hampton University where I enrolled as a marine science major. I attended Hampton University! Go pirates! I graduated with a Bachelor’s in Psychology! OMG!! I could go on about this question for light years, LOL! My top makeup brands are NARS and Makeup Forever. I love the color blue. I love Italian, soul, Mexican and brunch foods. My favorite vacation so far has been Punta Cana, Dominican Republic! I’m looking forward to traveling all across the globe and gaining more knowledge and experience with other cultures. I love, love, love Beyoncé! Everyone who knows anything about me knows that she is my girl! Oprah and Tyra Banks are my other inspirations. Each of these women are strong, beautiful, mindful and very aware of the power they possess. I began Sip of Positivitea by sending out motivational texts to just 5 people. As the list continued to grow, I chose to make social media pages for my inspirational messages and decided to name the pages Sip of Positivitea. Once I became certified as a life coach, I ran with the name for my company as well. My cell phone, lipstick and wallet. LOL! It is my firm belief that a gal has to buy something nice for herself daily! A day in the life with me would be waking up and going directly into prayer and meditation. I always have to give thanks to my higher power for giving me another day of life and opportunities. I value this so much. After prayer and meditation, I journal and repeat a few affirmations. Followed by checking my email and social media pages. Once I’m up and moving, I make sure I prepare for my clients, handle the day’s business and most importantly make some time for fun. To me life is all about balance and moderation. I love to read books. It’s so funny because as I child, I hated it. Today I LOVE it. I truly used to question the quote “knowledge is power”, but now I totally grasp that profound statement. I also love to swim, hangout with friends and enjoy my “me” time. Like anyone else I’m not a robot. There are times where I feel negative or out-of-whack. What I do to maintain my positive attitude the majority of the time is being self-aware. I often check in with myself to see what I’m thinking, how I’m feeling, etc. Honestly, the only way to maintain a positive attitude is through being aware and practicing mindfulness. I’m proud of my college degree, but I’m super-proud of being certified as a life coach, as well as a Master Trainer for the Creative Insight Journey (CIJ). CIJ is an eight week course, stemming from Stanford University’s Business Master’s program. Famous people like Steve Jobs and Bill Gates have taken this course, and over thousands of others have experienced its impact. I’m really excited to have the opportunity to live out my life’s purpose. It’s nothing but God that enables me. I would describe my personality as goofy, loving, happy, and powerful. This truly sums me up in a nutshell! I would have to say my outlook on life. Although physically I believe I’m beautiful – my soul, spirit and mind is what makes me truly beautiful. I love how I can look at life in such an optimistic manner and take on challenges knowing the end result will be just right for me. I would be Catwoman. She’s such a seductress, yet has the brains to match. She also helped Batman win a few battles and I believe every successful man needs a woman beside him who can stand on her own and back him up if need be. I feel that I can identify with her character from those perspectives. Success to me is knowing you’ve done your best, and no matter what obstacles or challenges you might face, you push yourself to keep going. When I’m going through something difficult I allow myself to process and feel my emotions. I wouldn’t be human if I didn’t! LOL! Depending on how difficult the situation is, I have different ways I process things. The most important, no matter what is going on, is to keep the faith, trust the process and try to remain both positive and optimistic. I always tell my students and clients that finding your purpose or being on a life purpose journey requires plenty of patience – especially during the bumps in life. You have to always remember that “Rome wasn’t built in a day” and the greatest of greats have all experienced rough patches. It’s all a part of the process of life. Just allow yourself to be open to trying new things and taking it easy on yourself when you make mistakes. I LOVE a nice platform heel. I don’t really have a preference of a particular heel or brand, but I do enjoy showing off my legs! I want the participants to feel empowered, encouraged and enlightened when they walk away from the workshop. My purpose in life is to inspire others to take action to reach their purpose. I hope to ignite and help someone take the necessary steps to discover why they were put here and how to work towards it daily. Follow Allynn on Instagram and Facebook.